A skin surgery wound is the cut made into your skin by a doctor during an operation or procedure. There are a number of things you can do to look after your wound, lower your risk of infection and encourage healing. Eat and drink properly. This helps your skin surgery wound heal. Follow instructions for bathing and showering. You will be told when you can have a bath or shower. A shower is preferred to a bath. You should not put any soap, shower gel, body lotion or talcum powder onto your wound. Wounds are closed with stitches (sometimes called sutures), metal clips, staples or glue. What is used will depend on the type of surgery, the type of wound, and the area of the body. Dissolvable stitches usually disappear in about one to three weeks. Do not pull your stitches. Non-dissolvable stitches are usually removed after three to 14 days. You will be told when and where they will be removed. Do not pull your stitches. Clips and staples are usually removed after three to 14 days depending on what surgery you have had. Do not pull your clips or staples. Glue may be used on smaller wounds and does not need removing. It usually peels off by itself in five to 10 days. You should try to keep the wound dry for about five days. Do not pick the glue off. A dressing protects the wound until it is healed, and protects any stitches or clips from catching on clothing. It also provides ideal conditions for healing and absorbs any leakage. Not all wounds need dressings. You will be told If your wound needs any further dressings when you leave hospital. It is important that you do not remove your dressing unless you are told to. If you have had a local anaesthetic, the effects will wear off after two to four hours. You may need some pain relief. You can use the tablets that have been prescribed, or you can take paracetamol. Do not take aspirin for pain as it can cause bleeding in some people. However, if you normally take an aspirin a day, do not stop unless advised to by your doctor. Some swelling is normal. If your wound seems very swollen, or the swelling is getting worse or causing problems, contact the surgery or an after-hours service. If your wound bleeds, press a clean cloth on the area for 15 minutes. Slowly release the pressure to check if the bleeding has stopped. If it keeps bleeding, reapply firm pressure. If it doesn't stop bleeding, contact the surgery or an after-hours service. Occasionally, the stitch line will break open. If this happens, don't be alarmed as it is quite easy to fix. Press a clean cloth over the wound and ring the surgery. The wound may need stitching again, or you may be told to let it heal without stitches. You don't need to go to an after-hours service if you can see your own doctor within 24 hours. slight pulling around the stitches as the wound heals. Don't pick off any scabs, as they protect the new tissue under the wound and act as nature's dressing. They will fall off on their own. Most wounds heal with no problems. 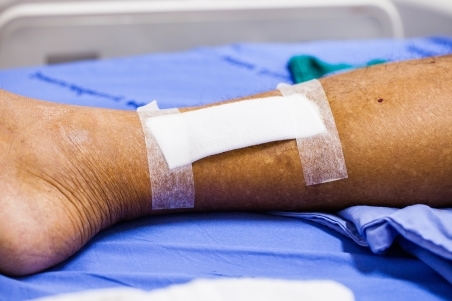 There is a higher risk of developing wound infections if you smoke, have diabetes, a poor immune system, or you have had a major operation such as bowel surgery. leaks a yellow or green discharge. Gently massage a skin softening cream (called an emollient) or vitamin cream on the healed area to help keep it soft and supple. It is important to protect the healed area from the sun. Written by HealthInfo clinical advisers. Last reviewed August 2017.